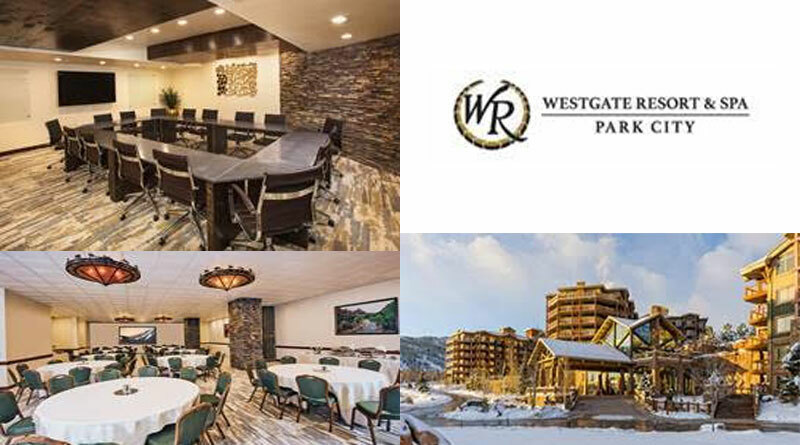 Westgate Park City Resort & Spa recently completed a multimillion dollar renovation project to better serve and facilitate group meetings and events. The project included a brand new outdoor event deck, upgraded meeting space, coffee bar, banquet kitchen and executive boardroom. With high-end finishes inspired by the resort’s picturesque mountain backdrop, the executive boardroom can accommodate up to 20 people. Designed with the functional needs of executives and VIPs in mind, its highlights include stone accent walls, wood ceilings and the latest cutting-edge technology. These upgrades join the existing 6,000 square feet of indoor meeting space, also designed to create a mountainside ambiance. The new event deck can accommodate up to 250 people and offers an ideal outdoor space amid a mountainous setting for hosting meetings, cocktail functions and wedding ceremonies. During the summer months, dining with food fresh off the grill will also be available for groups and special events. The new modern banquet kitchen allows the resort to quickly and efficiently serve groups of more than 200 people from an award-winning menu of mouthwatering culinary offerings. Guests can expect the same high-quality food that has won Westgate Park City Resort & Spa numerous accolades such as the 2017 Forbes Travel Guide Recommended Award for Edge Steakhouse and Best of State Award, Utah 2017 for Best Gourmet Burger. With the new upgrades and first-class facilities that already exist, Westgate Park City Resort & Spa now offers more than 8,500 square feet of indoor and outdoor meeting space. For more information, visit www.WestgateParkCity.com. One of Utah’s premier mountain resorts, Westgate Park City Resort & Spa features a prime location at the base of Canyons Village at Park City Mountain, spacious and attractive accommodations, and a variety of on-site amenities, including ski-in/ski-out access to Park City’s 7,300+ skiable acres, a free ski valet service, the Forbes Four Star Serenity Spa by Westgate, an indoor/outdoor pool, Drafts Burger Bar and AAA Four Diamond Edge Steakhouse, the two-time award winner for Best Restaurant in Utah in the Best of State awards. For more information about Westgate Park City Resort & Spa, visit www.westgateparkcity.com. Founded in 1982 by David A. Siegel, Westgate Resorts is one of the largest resort developers in the United States. Westgate features 28 themed destination resorts, with over 13,000 luxury villas in premier locations throughout the United States. Most Westgate Resorts locations feature a variety of unique restaurants, retail and spa concepts, including Drafts Burger Bar, Westgate Smokehouse Grill, Edge Steakhouse, Westgate Marketplace & Deli and Serenity Spa by Westgate. For more information about Westgate Resorts, visit www.westgateresorts.com. ← Royalton Luxury Resorts Announces Plans for Two New All-Inclusive Properties in Cancun and Antigua.